A little southwest of yesterday's bridge is a long slab bridge with a steel truss span across the Mokelumne River. We have looked at several other bridges crossing the Mokelumne in Amador and Calaveras Counties. 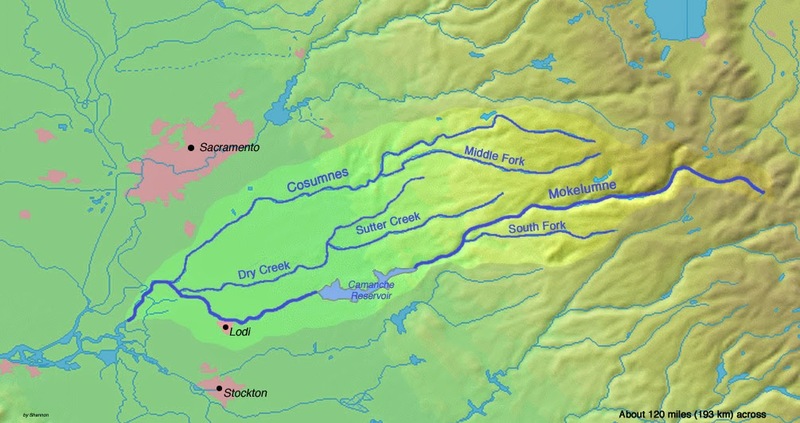 It's a 95 mile long river that empties into the San Joaquin River at the border with Sacramento County. The Peltier Road Bridge (29C0037) is an 881 ft long viaduct with a 152 foot long Parker camelback truss span across the Mokelumne River. The bridge is only 24 ft wide, it has a vertical clearance of 14.7 ft, and it was built in 1948. The bridge was closed in 1973 when the portal frame was struck by a truck carrying an oversized load on a trailer. According to the Lodi News-Sentinel the driver's insurance company agreed to pay for the repairs since the driver was driving without a permit. This was the only bridge over the Mokelumne for many miles and the bridge had to be closed for several months while repairs were made. San Joaquin County, California Bridges: Peltier Road Bridge across the Mokelumne River by Mark Yashinsky is licensed under a Creative Commons Attribution-NonCommercial-NoDerivatives 4.0 International License.